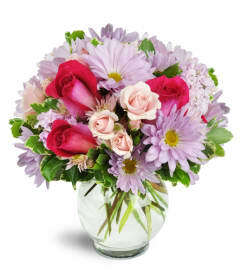 Let someone know just how special they are with our Precious Pinks bouquet! Petite pink spray roses bob sweetly among gentle white daisies, filling the room with pure happiness! 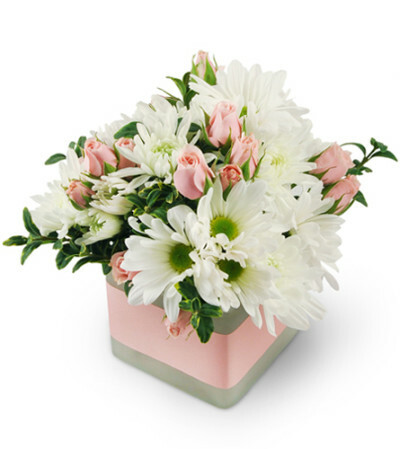 Neatly nestled in a vase with a pretty pink satin ribbon, it's the perfect arrangement to welcome a new baby, or to make any day extra special. Pink spray roses and white chrysanthemums make up this lovely arrangement, completed with oregonia, pink ribbon, and a frosted glass vase. “I had an excellent experience. Staff was very friendly and very helpful especially the lady who helped me out on July 2nd”. 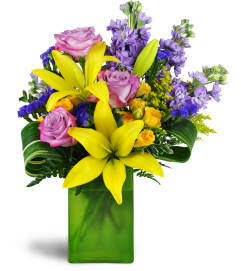 The Flower Shop Reg'd is a Lovingly Florist in Brockville. Buying local matters. Discover how Lovingly supports local florists. Copyrighted images herein are used with permission by The Flower Shop Reg'd.